The Fargo DTC4250e ID Card Printer comes with additional security features that reduce or eliminate the risk that your printed ID cards will be replicated. From a password protected printer that only allows authorized personnel to print cards to data encryption, you can get highly customized cards that are hard to copy. The Fargo DTC4250e ID Card Printer is both flexible and scalable with a unique modular design that makes it easy to upgrade when your needs change. You can choose dual-sided printing that gives you bar codes or digital signatures on the back and also holographic or fluorescent overlamintes that increase your cards’ security and eliminate the possibility of forgery. 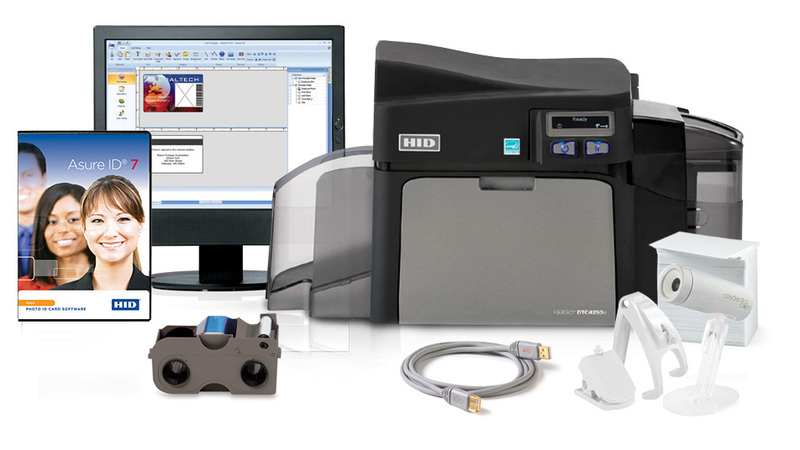 The Fargo DTC4250e ID Card Printer is compatible with other Fargo products so that you can create the system you need for your security requirements. For example, the iCLASS SE embedded encoder allows you to create custom smart cards, and the Assure ID card personalization software and EasyLobby secure visitor management solutions give you access to additional features. Options include easy-to-use ribbon with disposable ribbon cartridge (EZ) and more economical and eco-friendly refill ribbon for cartridge (ECO).